Life & Events > Happy Groundhog Day! so he's going back into his burrow and eat cupcakes 'til 2013. Bake me a dozen please (if they're chocolate - my favorite)The decorating is most artistic!! Wishing you a great day, Randy! Yes, and it just tickles me to look at it! It really looks like a groundhog. Love this! My father-in-law's birthday is today, so I sent him this picture. He always loves a big birthday fuss (with balloons) so a couple years ago I sent away for a bunch of Punxatawny Phil souvenirs - beads, paper plates, you name it - for his party. He was as excited as a 6 year-old. 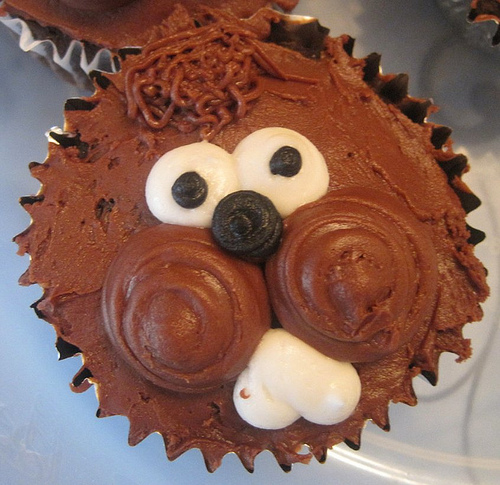 I think this is the cutest groundhog cupcake I've ever seen! I wouldn't mind having a multi-month supply of them either.